Simple Phone Book is just what the name implies, a simple, easy to use phone book program with minimum bells and whistles. All it does is store data. It’s not the worlds most advanced and techie address book. It’s a simple way to keep track of numbers and whatever else you want. Add unlimited entries and custom fields. Custom colors for each individual type of entry for easy reading (e-mail can be blue, home phone can be yellow, etc.). Easy to use interface with minimum extra junk to dig through to find what you need. Simple search for larger databases. 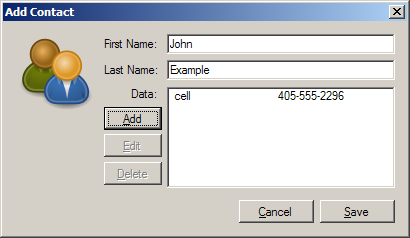 Simple Phone Book 0.3 requires the Microsoft .NET 2.0 framework. What do you think about Simple Phone Book v3? Rate it! The new version started but showed the following error when I tried to Edit/Delete a record. As suggested, I have found a couple of alternatives. I will keep visiting your website and test the re-written version when available. It looks like SPB doesn’t work on newer versions of Windows. I just tested on both 32-bit and 64-bit OSes, thinking that might the issue, but it crashes with the same error your receive. This application was last tested by me on Windows XP. A re-write is in order to work with modern operating systems, but since it’s not one of my more popular applications, it may be put on the back burner for the time being. Sorry about that, hopefully you will be able to find an alternative solution somewhere on the web. I took a look at the project code and the problem was a simple issue with compiling for modern 32bit/64bit operating systems. I’ve uploaded a new version that should work now, and also includes a quick fix for high DPI screens since the old version wasn’t playing well with new 4k resolution monitors. It also deals with the fact that newer OSes don’t like you writing to the application directory, and upon first startup, will create the database in your My Documents folder. If you are upgrading from a previous version, it will copy your old database to the new, correct location and function normally. No more admin privileges required to run the application!